NEW TO HOBBY!!! Currently, no baseball cards are hotter than prestigious high-grade late 1940's/1950's rookie cards of our National Pastime's greatest stars. Seemingly achieving record prices with each passing sale, there appears to be an infinite-like demand and pricing surge for the inaugural cards of Mantle, Mays, J. Robinson, Aaron, Clemente, Koufax and so many more. 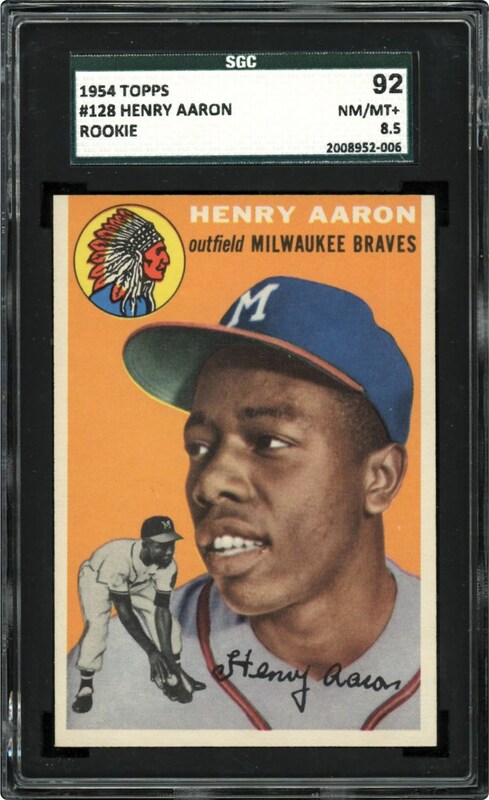 With regard to Hank Aaron, one of the most undervalued post WWII cards has always been his 1954 Topps rookie card. Fortunately, this inexplicable disservice to "Hammerin Hank's" first cardboard issue no longer exists, with each passing sale of his high-grade 1954 Topps gem achieving staggering price tags. Presented here just happens to be a breathtaking SGC 8.5 NM-MT+ Rookie card of the legendary slugger. Due to the ongoing steroids issue in professional baseball, many diehard baseball fans still consider Aaron's 755 lifetime home runs the all-time mark, dismissing Bond's "tainted" 762 statistical high mark. Additionally, Aaron is a member of the elusive 3,000 hit club and is the undisputed owner of the most lifetime R.B.I. 's in Major League history. For these reasons alone, more hobby enthusiasts are beginning to "jump aboard" the Aaron bandwagon, seizing his prized high-grade cardboard artifacts before they reach a stratospheric level. A young Aaron portrait image accompanied by a black & white fielding pose are both set against a brilliant orange background, with the classic illustration centered between four white borders. Pin-point corners, a gleaming surface, extremely sharp edges, and a pristine-like verso complete one of the finest looking Hank Aaron rookie cards in circulation. 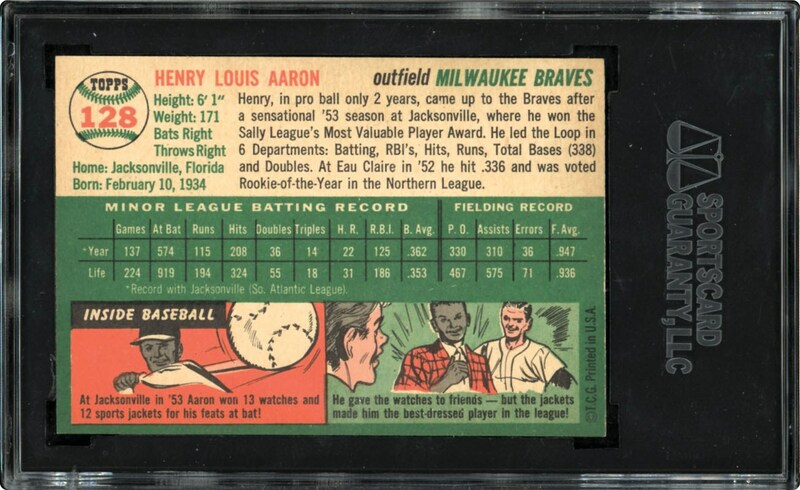 Any visually striking cardboard example of the first player to surpass "The Babe's" home run mark is worth pursuing, but an SGC 8.5 Rookie card masterpiece of that same player is a "must have" for any serious collector!